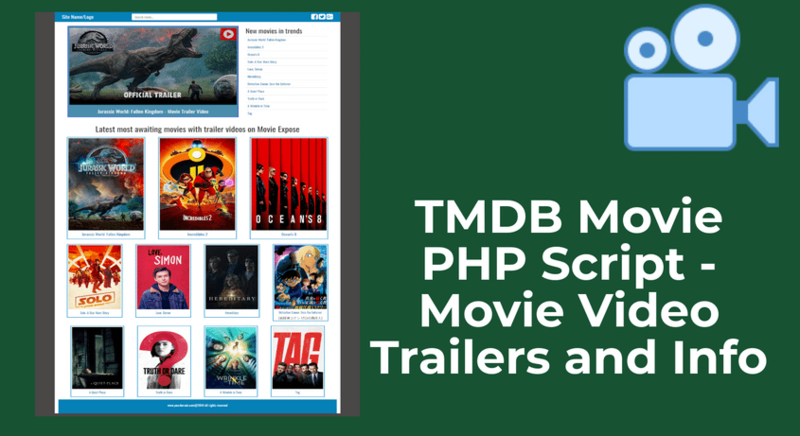 TMDB Movie PHP Script is developed by a CodeSpeedy team member to retrieve and show movie video trailers and info. This PHP script uses the TMDB API. TMDB or The Movie Database provides API key which developers can use to retrieve movies. The TMDB provider has a wide range of movies. From most popular Hollywood to regional Bollywood even Tollywood movies are also is in the database of TMDB. Show movie video trailers (if available from TMDB). Poster image and banner image of the movie (if available from TMDB). The script is very easy to configure. All you need is just to put your TMDB API key that you will get from official TMDB website. Ad space available where you can put your advertising code for example AdSense. Most of the script works on AJAX that can save lots of the bandwidth. Star icon’s star rating for movies. Movie search functionality available that works on AJAX. Show various information about the movie user search for or click on. Documentation is available. You will get the documentation file after purchasing this PHP script. To use this Movie PHP script, you need to get the TMDB API key. You can get the API after you create an account on https://www.themoviedb.org/.